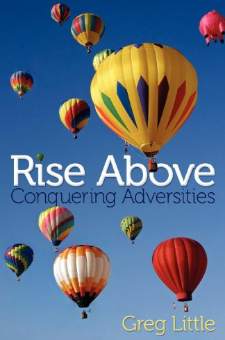 Rise Above is a detailed description of one man's journey of conquering adversity. You will read how the writer survived a near-fatal motor vehicle accident, which resulted in three skull fractures, a bruised brain, an eight-day coma and having to relearn how to walk and talk - made all the more challenging by a lingering speech impediment acquired in childhood.Stuttering is an awful burden for a person to carry throughout life. Children can be cruel. The writer's utmost fear, speaking in public, would one day be an ally and allow him to present programs extensively throughout the Untied States.Normally, our children bare the task of planning our funeral. It is not "normal" for parents to plan their child's funeral; unfortunately, life is not always "normal." You will read how the writer faced his greatest challenge....the death of his child. You will also read about the tools and support systems the author and his family found vital when confronted with the journey of grief.This book is not about surviving adversity. It's about thriving beyond adversity.